A couple years ago I wanted a 4x4 to help with access on my driveway (a mile long and snowy in wintertime), so I picked up an old '85 Toyota extra-cab. The good kind with a solid axle in front and the carbureted I4 engine that kinda made these things famous. I hauled firewood, busted through snowdrifts, drove down roads that nobody should have been on, explored places that were off limits to my previous rides, and was happy with it until last August when an inattentive driver behind me rammed into it at 20-35 MPH. That was not a good day . The impact seriously dented the truck's bed, destroyed the bumper and tow hitch, and bent the frame 45 degrees where these last two had attached. The insurance payout, needless to say, was not enough to cover the replacement cost. Any sensible person would have written it off like the insurance company did and got on with their lives. But being the crazy guy I am, I decided that I was better off welding together a new flatbed and bumper, as well as fabricating and attaching a new piece to the frame. I have no welding knowledge, training, or ability, so what could possibly go wrong? Long story short, it didn't. My flatbed hasn't exploded on the highway yet... And it gives the truck loads of that hillbilly bling! Useful for a deer/elk carcass, too! The proof-of-concept crane is done!! I wanted something that would not mount to the bed It's designed to support the capacity of the truck uniformly distributed, not all on one corner while a crane lifts it. So I built a monster out of two old tractor hubs, a couple of monster trailer jacks (maybe from a tractor-trailer??) a couple hundred pounds of scrap metal, and a Harrington hoist that cost me $5 because it was at the scrap yard instead of the store. 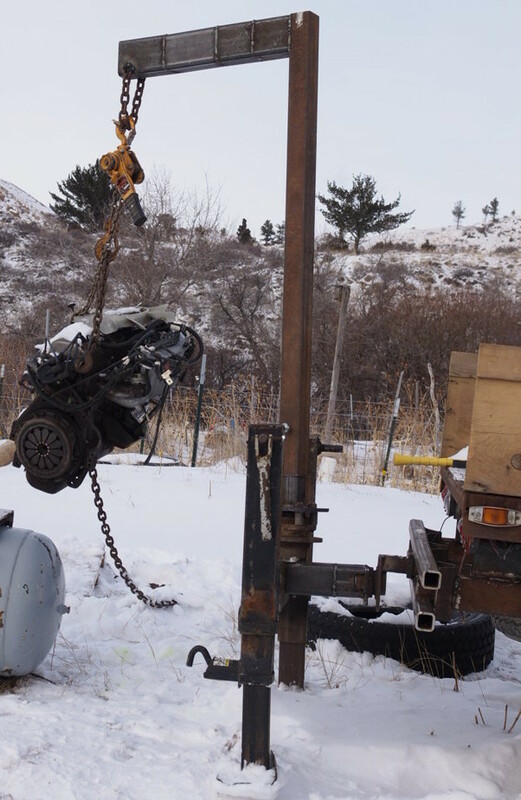 The engine block in this picture weighs several hundred pounds, but the crane didn't have any trouble with it at all. Last edited by Lewis Hein; 02-22-2019, 08:53 PM. Please keep us posted. I would love to see this thing with a dually convertion. Maybe even a 4BT Cummins. Latest update: It's been way too cold to be out there welding unless you're a pro (I'm not), so the truck is exactly as I left it. Hopefully as the weather warms up and my bank account recovers from the holidays I'll be back at it. I love those old Toyota trucks.